Available in English. Charts only, no written row-by-row description. Difficulty: Medium to advanced. Charted RS rows only, but WS rows are worked as they appear (knit the knit sts, purl the purl sts), with some small extra action here and there, so the ability to read your knitting is essential. 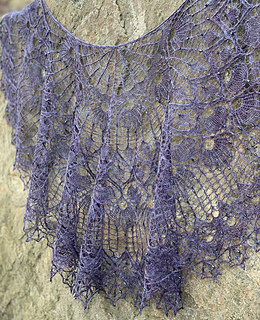 Yarn: Dye Diana Dye FlaxenSilk cobweb was used for the shawl shown here – yarn held double! 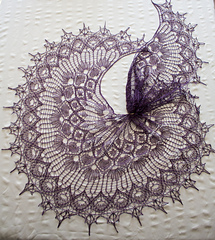 1312 yards (1200 m) or 80 g. This corresponds to 656 yards (600 m) if using a heavy lace single strand. If substituting, use yarn with good stitch definition to show off the cable pattern to best effect. 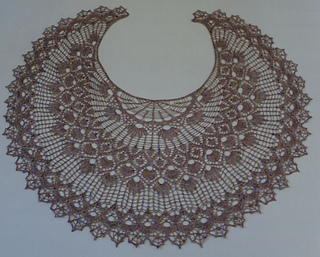 Construction: The shawl is worked from the neck down and bound off using either a crochet or knitted picot bind off (your choice, picots can be left out). 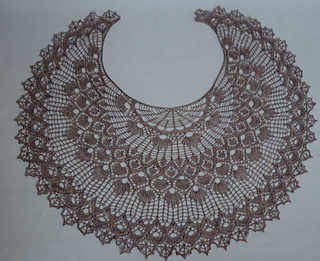 Size: 20 ½ inches (52 cm) deep and 45 inches (115 cm) inner circle using the recommended yarn and size US 4 (3.5 mm) needles. Needles: Size US 4 (3.5 mm) circular needle or the size you need to get a fabric you like. Cable needle. Spare needle for the cast on and I-cord tab may be useful but is not strictly necessary. Beads: 1409 size 8/0 seed beads or the beads of your choice. Chart B 121 beads, chart C 254 beads, chart D 205 beads, chart G 451 beads, chart H 378 beads. You can use less beads than that by only beading some of the sts or leave beads out completely if you wish. Other notions: Crochet hook one size larger than your needle for the bind off (or use a knitted bind off if you don’t like crochet). It is necessary to print in colour (or use a marker pen after printing), as some of the sts are colour coded.